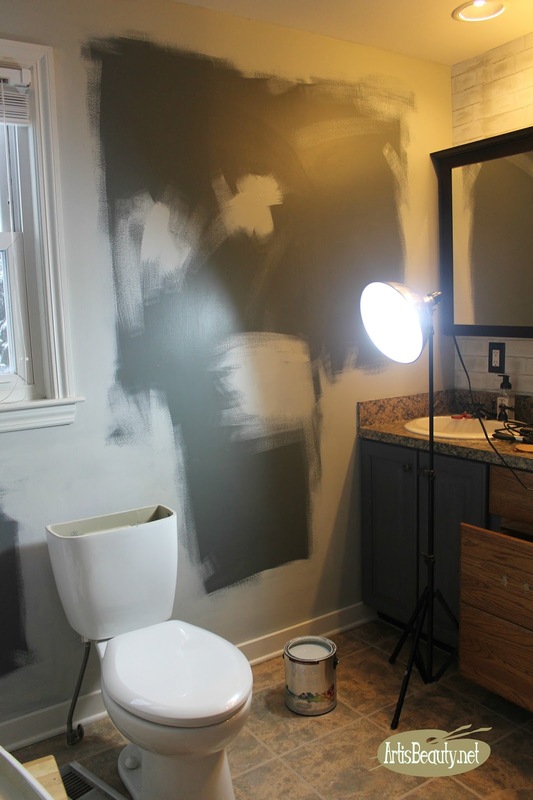 ART IS BEAUTY: Budget Bohemian Bathroom Makeover ~ Before and After! 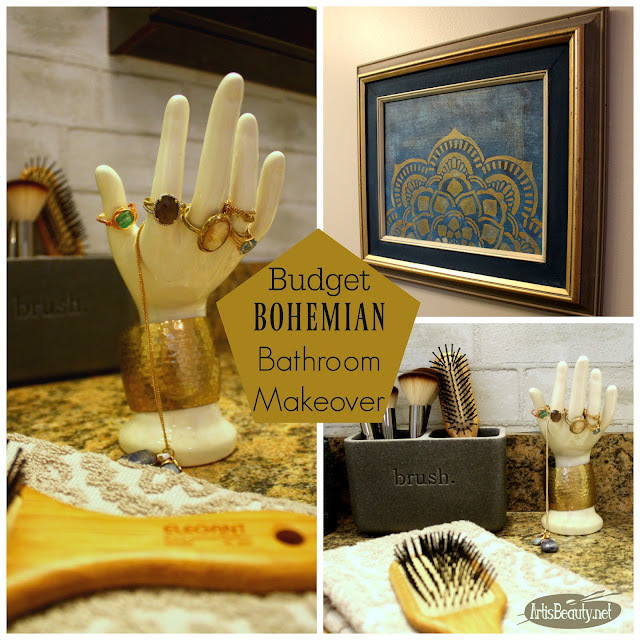 Budget Bohemian Bathroom Makeover ~ Before and After! 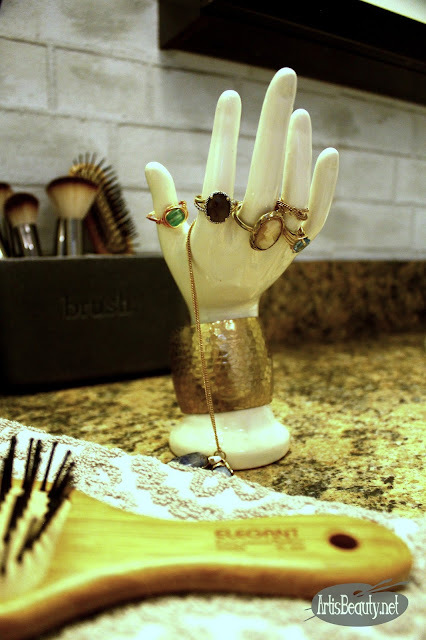 I have been working on multiple projects and pieces for the booth, but I have been itching to show you my Budget Bohemian Bathroom Makeover! I tried to wait out the weather so I could get some nice natural light to photograph, but alas; I live in Michigan and LIGHT is not something we are in surplus of here. I could have brought in my photography lights, but being a bathroom there really was no where I could put them without them showing up in any of the mirrors in the room. SO, in keeping the "KEEPIN REAL" theme I tend to lean towards ...Here it goes! 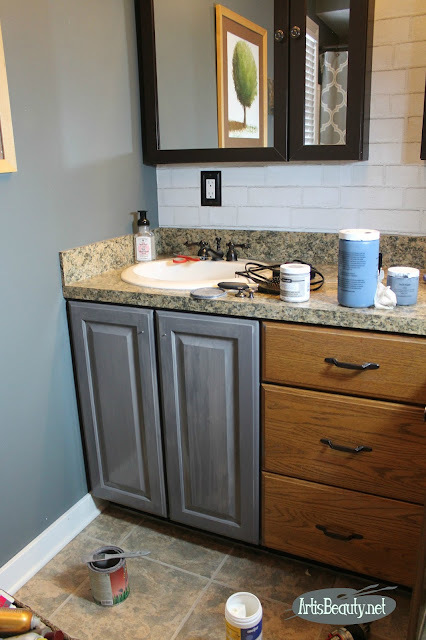 Now I know its not terrible, but we have lived in this house almost 20 years and this vanity is STRAIGHT OUT OF THE 80's. That tell tale Golden Oak that was so popular. Now I know from the pics it doesn't look too bad, but what you can't see are the deep grooves from our old dog trying to dig to China on one of the cupboards when she got scared during a thunderstorm. Being a BUDGET makeover my goal was to keep as much stuff as I possibly could. 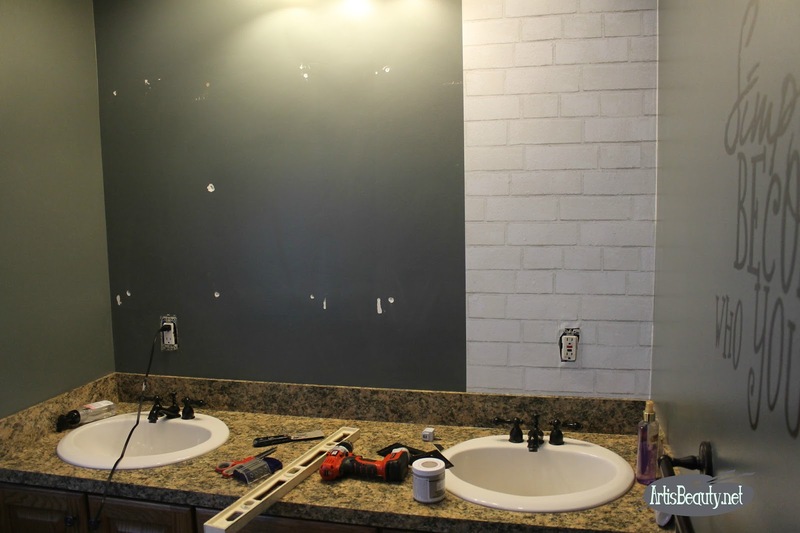 The tile is still in great condition as well as all the fixtures. I didn't want to replace or spend money on anything I didn't have to. The first goal of my makeover was to give the bathroom a little character. 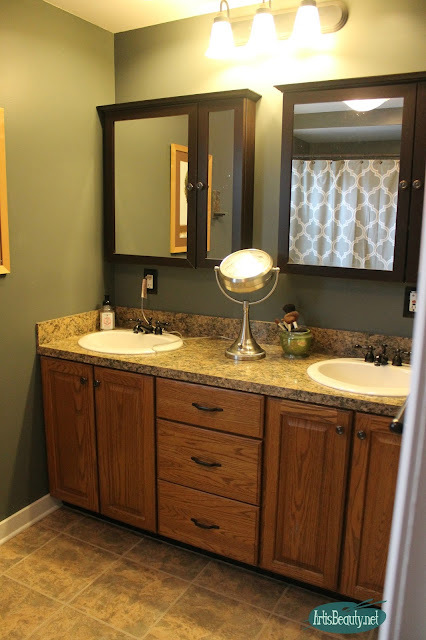 Our home is 70 years old but this bathroom at one time had been half the size and one of the previous owners knocked out the wall to a giant closet and doubled the size of the bathroom. That turned it into a big old square box shape. To give the room a little more fun and excitement I decided to use some Faux White Brick removable wallpaper. I will tell you it took me 45 minutes to hang this one piece. Seeing as our house it OLD..walls aren't completely straight and unlike regular wallpaper this stuff doesn't SLIDE around. You have to make sure you have it positioned where you want it before press it down. Once I got the first row down the rest went much faster. Since I was working in a room the children need on a daily basis, I did things in steps. 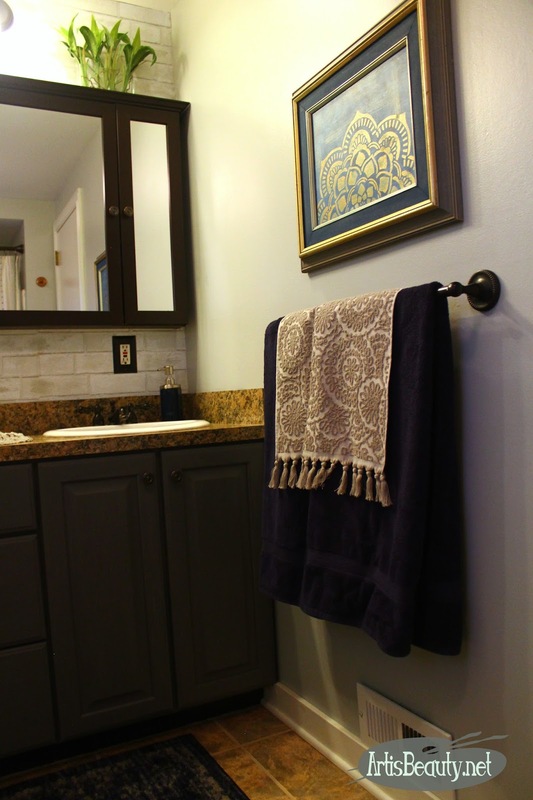 You can see here once I had hung the wallpaper I put the medicine cabinets back up. 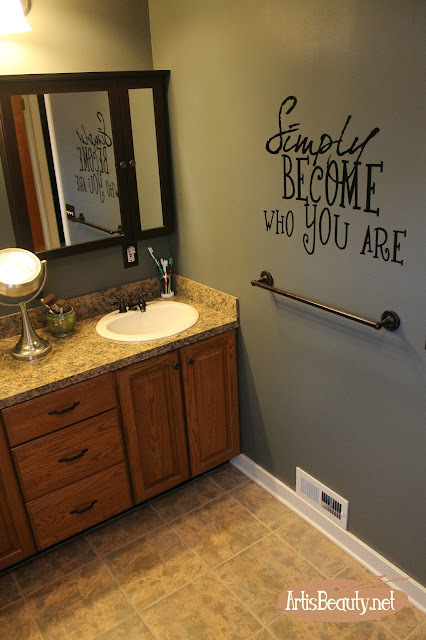 Now normally I would have painted before I put them back up but having all the stuff piled in the hallway wasn't really conducive to a functioning bathroom for the kids. Now it was time to decide what color I wanted to paint the cupboards. 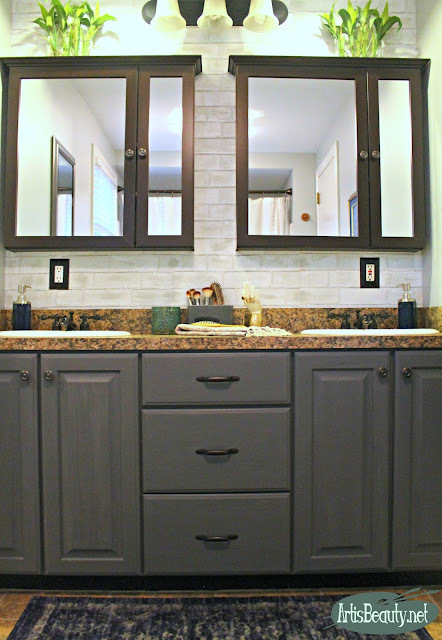 I chose General Finishes Driftwood Gray. Again I worked in stages to keep the bathroom functioning. After I had my cupboard paint picked out I could choose wall color. 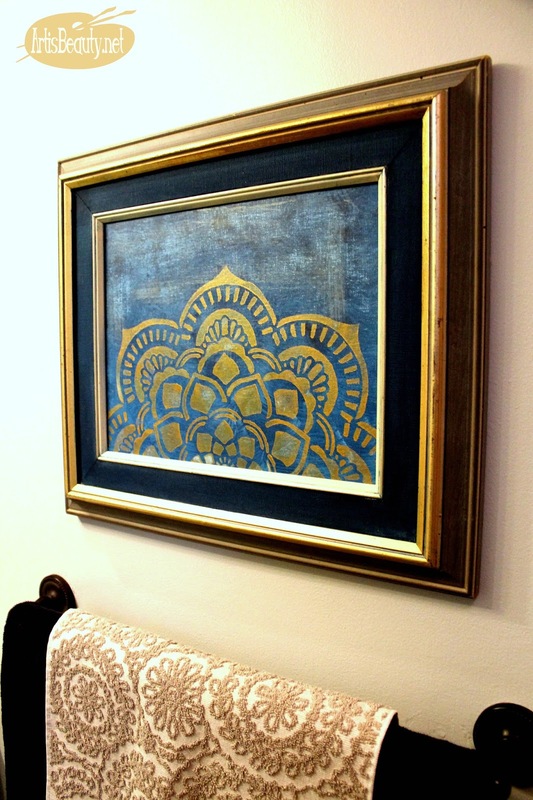 I had a color custom mixed to match the shading in the mortar of the wallpaper. I love how it all turned out. You can see here I kept the old towel bar and added some handmade art work above it. For some of the decor I just grabbed stuff I have had around my house. 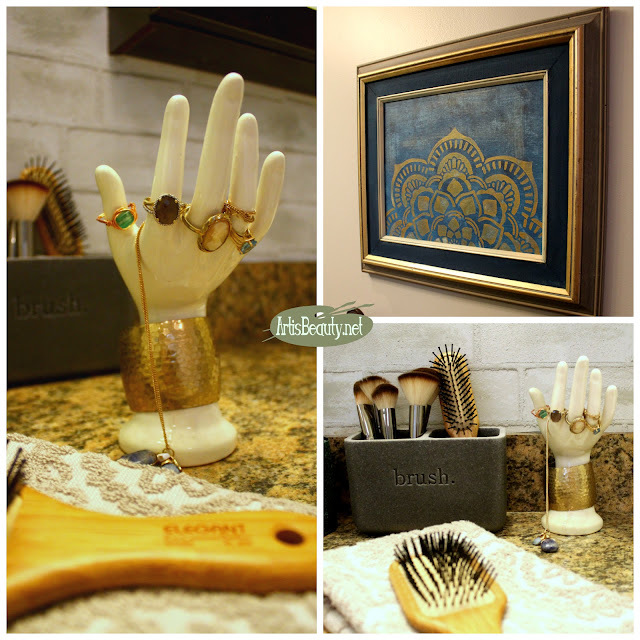 Some thrifted items, handmade items, a gallon of paint and one roll of wallpaper made for a Budget Bohemian Bathroom Makeover. I will be back soon with the DIY for the artwork and some other furniture pieces I have been working on.